159/214 Max Braden This is a standard rashoman-con artist cop thriller, not bad, not great. Slow Burn, or: From Wise Guy in a Martin Scorsese Film to District Attorney in a Mediocre L.L. Cool J Movie in Less than 20 Years. 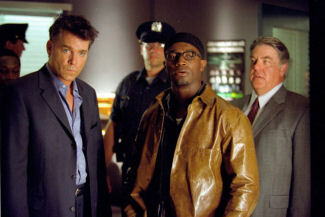 That's right, Ray Liotta stars as Ford Cole, a district attorney and L.L. Cool J is a street gang leader named Luther Pinks in this movie from first-time director Wayne Beach (though he did write Murder at 1600 and The Art of War). Cole's life gets rattled when Nora, an assistant D.A. (Jolene Blalock) admits that she killed someone, but that it was in self-defense. The day goes from bad to worse, though, when Pinks shows up and contradicts Nora's version of the events. Throw in a stranger (Mekhi Phifer) who is somehow involved and things begin to slowly deteriorate.